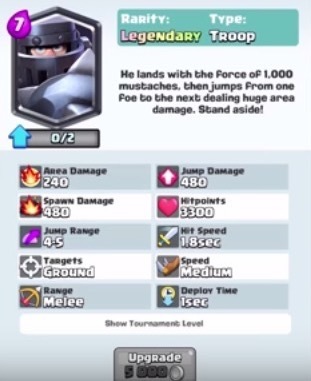 Mega knight is an expensive 7 elixir cost legendary card. Its has an area damage of 240, with spawn damage of 480. Its is a very powerful legendary card with huge area damage. Its targets ground unit and has 4-5 jump range. Its has 1.8 seconds hit speed with massive 3300 hitpoints. For Mega Knight Update visit here.